I can remember when Aussie livestock was about as hard to come by as the new "hybrid ultra awesome reverse disco chalice," or whatever the current obsession happens to be. 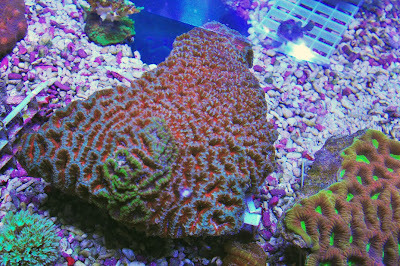 It was not that long ago really, I remember being at my first coral farmers market in 2008 and hobbyist's searching out the next hot acanthastrea. 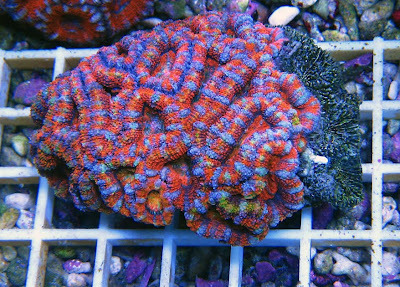 Back then nearly any color acan was desirable and they were all flying off the few farmer's frag racks who had them.This was the same CFM where 2 inch pieces of Sunset monti were going for upwards of two or three hundred, o how times change.. It was very difficult to get a hold of any Acan Lords, even from some of the better know wholesaler/importers in Los Angeles. Even when they did begin to trickle in, they commanded steep prices, and still do, though not as much during the "Acan' Rush of 2007/2008." It was not uncommon for small 4 inch colonies to be selling for four to seven hundred dollars and up, WHOLESALE!! Any how, Australian livestock has always been a hot commodity, with good reason. 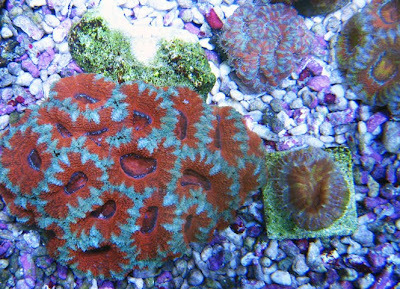 The quality and coloration of Australian corals and fish is second to none. Now is a better time than ever for Aussie livestock, with great fish, SPS, scolymias, and of course mid blowing acans showing up more frequently, through the right sources. I've heard some hobbyists complain that acans are old news, apparently a bygone trend like your dad's leisure suit. If your into this hobby to follow the fads and trends, then we are in it for seperate reasons. 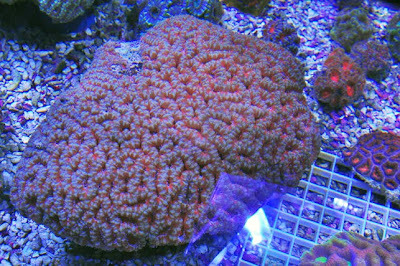 I love all coral, especially colorful ones, from "common" fungias, zoas, mushrooms, acros, favias, you name it. 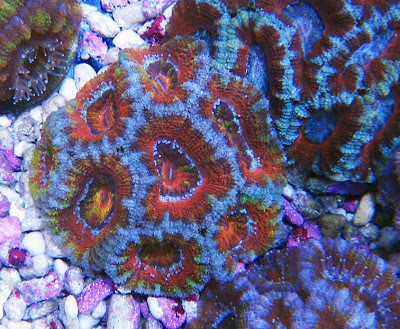 Acans come in some of the most beautiful color patterns of any coral, but to each his own and some people truly arn't interested. It's interesting, I talk with various suppliers of mine, and they tell me in some parts of the country theyre saying "no more acans, we cant sell them" whereas in others, people like me are saying "send me acans, acans, acans, got any rainbows?" Thus is the dilema for the livestock dealer, its not what we like, its what the customer likes. 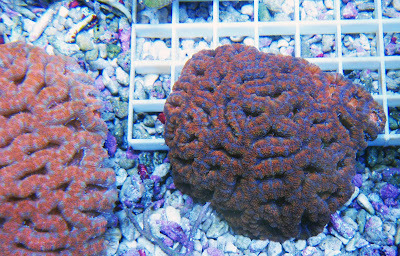 It can be hard to predict sometimes, which is why we try to collect the best variety of the best pieces every coral we find. 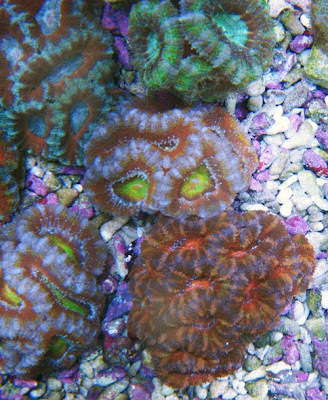 Here are some Acans we have at the store right now that I thought I'd share. LARGEST colonies I've seen, taking up nearly an entire lg. Well that's it for now, I should be getting another shipment Friday full of surprises, and I will do my best to keep you posted! Sunlight Supply Announces Tek Light "Elite"!! Hot on the heels of their recent announcement of the new 60" Tek light, Sunlight Supply has graced us all with the early annoucement of the Tek Light Elite series of self cooled lights. Sunlight has been deluged with calls concerning the new lamp and its release date, as of right now it will be a few months. This is great news and makes a great lamp even better. Many people have understood that keeping T5 bulbs cools helps them run more efficiently, increasing lamp life. In fact, it may seem like somewhat of a surprise its taken S.S. this long to add fans in the first place. Especially considering many other T5 units come with fans, like those from current or aquatic life. New Products at The Mystic Reef, CAD lights! 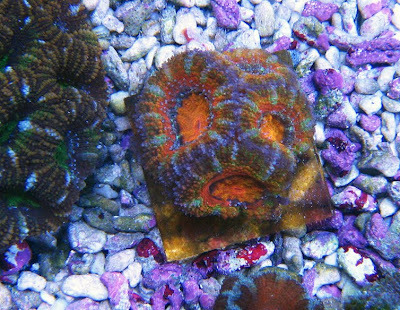 CAD lighting is probably best known on the east coast for their rimless All-in-One nano systems and customs aquariums. 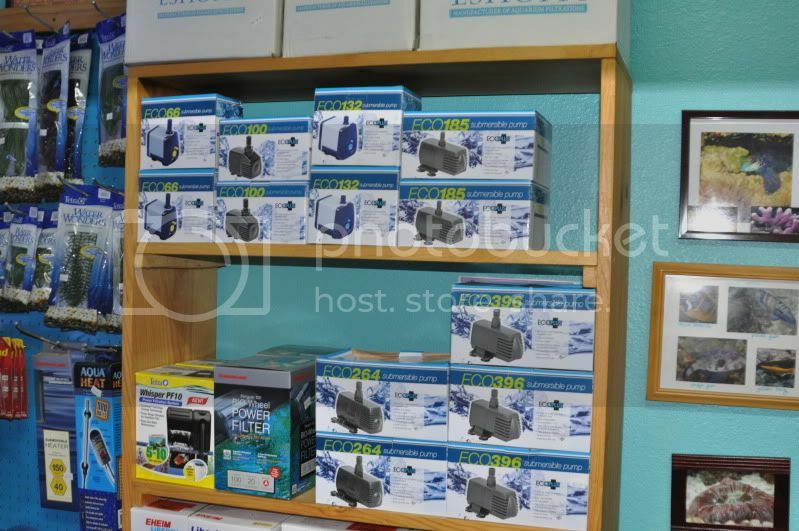 The Mystic Reef is proud to bring in their line of protein skimmers, all in one nanos, faux coral inserts, sumps, and lighting systems. CAD has earned a good reputation on the east coast, and were one of the first stores to bring it over to the west coast, however they are getting their warehouse set up and you should start to see their products hitting other stores shelves in the next few months. CAD manufactures stock rimless tanks from 12 to 50 gallons, with starphire options available. The nanos have some unique feature compared to other "all-n-one" tanks on the market, such as a built in refugium chamber. These tanks are definitely in a class of their own visually. The rimless design is very elegant, especially when the light is suspended rather than mounted on legs. The bullnosed bottom glass is also a very higher end feature. There definetly is a niceThey are available with either power compact or 4 lamp T5HO fixtures. Their line of BubbleMagus skimmers appear to be well built, and the NAC 66 seems to be a strong competitor in the midrange skimmer game, and is rated for 250-350 gallons, depending on bioload. Typical top-down, typical green slimer? 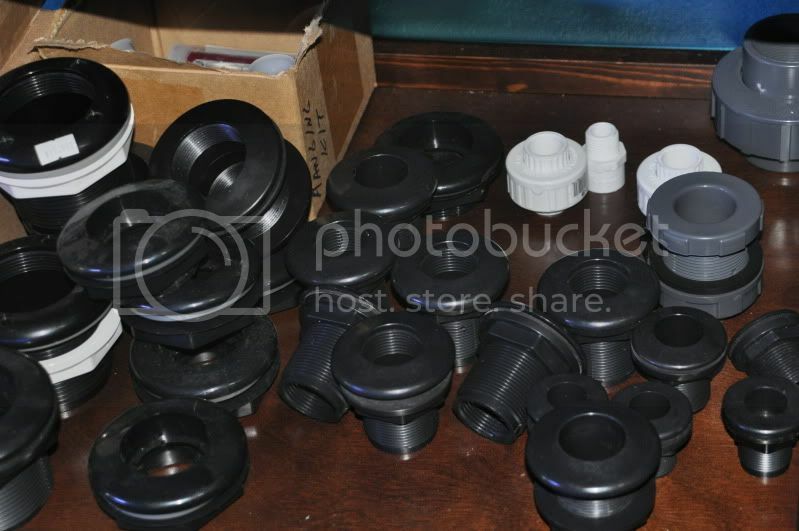 Just a reminder, we also stock a full assortment of hard to find plumbing parts like, bulkheads, loc-lines, unions, tru-union valves. 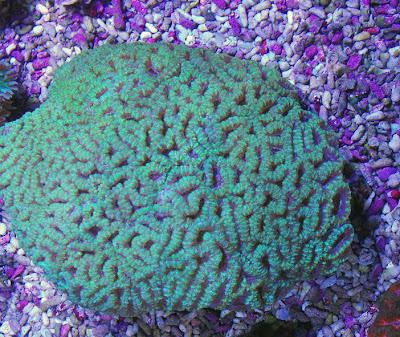 In other news, we have been brining in more corals than ever, with more exciting rarities on the horizon from secret locations just now beginning to ship out corals, hot new tank raised nano fish, and LEDs rumored from various manufacturers, 2010 is definitely looking BRIGHT! !